Imagine going into your favorite coffee shop, browsing an online catalog from your laptop, and upon finding that special book you’ve been searching for, having it printed and bound for you while you sip your latte. The Espress Book Machine, from On Demand Books LLC, is making that dream a reality. With a small physical and budgetary footprint, the machine promises to revolutionize book publishing, distribution and sales. Beta versions of the Espresso Book Machine are already in operation at the World Bank Infoshop in Washington, DC and the Bibliotheca Alexandrina (The Library of Alexandria, Egypt). Recently, a production version of the machine was installed and demonstrated at the New York Public Library. Additional machines will be installed this fall at the New Orleans Public Library, the University of Alberta (Canada) campus bookstore, the Northshire Bookstore in Manchester, Vermont, and at the Open Content Alliance in San Francisco. A smaller version of the machine is in the works. Recently, we interviewed Dane Neller (right), CEO of On Demand Books LLC, about the Book Espresso Machine. Dane is co-founded the company with publishing legend Jason Epstein, and formerly served as President and CEO of Dean & Deluca from 1997-2005. FPP: Could you provide a brief description of how the machine operates and some of its general capabilities? 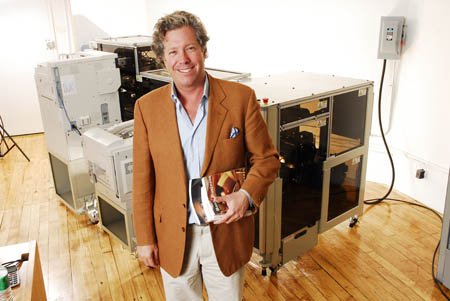 Dane: The Espresso Book Machine (“EBM”) is a fully integrated patented book making machine which can automatically print, bind and trim on demand at point of sale perfect bound library quality paperback books with 4-color covers (indistinguishable from the factory made original) in minutes for a production cost of a penny a page. Digital files are retrieved and transmitted via the Internet through our proprietary web-based digital rights management software. The EBM requires minimal human intervention and maintenance, and all printing, book block milling, page jogging, cover alignment, binding and shearing are performed in a continuous mechanical process. FPP: The Espresso Book Machine has been referred to as an “ATM for books.” Can it be configured to be operated in an automated fashion (like an ATM) by a consumer? Dane: Yes. Orders can be entered at a home/office computer, or at an in-store kiosk. The current models are not configured like a traditional vending machine, so that the printing of the book is likely to be done in a stock room, back office or behind an information desk where a clerk retrieves the book for the reader. But order entry can be done anywhere at anytime. FPP: How much does the Espresso Book Machine cost and how much physical space does it occupy? Dane: The current models are being custom manufactured but are still a fraction of the cost of a traditional POD line. Our plan is to lease EBM’s and charge on a per book basis. 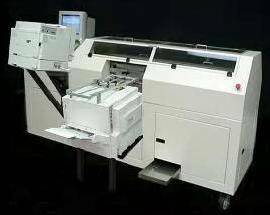 We expect that in mass production the EBM will cost about the same price as a large office copier. The current 1.5 model is about 8′ x 5′ but version 2.0 will be about 5′ x 4′. FPP: How many machines do you expect to have installed over the next 3 years? Dane: We hope to have installed over 500 EBM’s by the end of 2009. FPP: Who are your primary target customers for the Espresso Book Machine? Dane: Our target customer includes public and academic libraries, bookstores, coffee shops, university bookstores, university presses, hotels, US post offices and other government offices, reprographic shops, supermarkets, mass retailers, cruise ships, UN agencies, etc. FPP: How do you think bookselling models might change as adoption of the Espresso Book Machine spreads? Dane: Bookstores will be able to reconfigure their floor space to sell faster moving, higher margin inventory and rely on the Espresso for mid- and backlist books. Since the Espresso is a mini electronic book store, non-bookstore retailers will be able to use the machine to print all types of books, which will increase competition and probably reduce book prices. Also, self-publishing will become a profitable business for bookstores, libraries and other retail venues. FPP: How would you expect the pricing of books to change once they can be printed at the point of sale? Dane: As noted above, prices will likely decline as more stores have Espresso’s. Since the EBM eliminates all supply chain costs, the price of content relative to the overall price of the book is likely to increase while the cost of distribution and printing as a percentage of the price of the book is likely to decrease. While it is very difficult to predict pricing patterns, we believe that book prices will decrease especially with long tail books. FPP: How do you think publishers will need to adapt their book marketing strategies (if at all)? Dane: Publishers will need to digitize their backlists and allow these titles to be easily searched. Some marketing and promotion of these titles may be helpful, but just making them available on the Espresso will allow publishers to monetize their backlists. FPP: Do you think eliminating the distribution barrier will encourage more books to be published? Dane: Yes. With the EBM no book need ever go out of print, and any book in any language can be available anywhere in the world. More books will be published efficiently i.e., supply will be matched with demand. FPP: What are the remaining hurdles for getting access to all published works? Dane: The scanning of book files, and a settlement with Google on the copyright lawsuit, which I predict will happen since Google and content owners can both be winners. FPP: Are there any consumer buying habits that will need to change in order for this technology to be successful? Dane: On the contrary. The Espresso liberates consumer demand similar to what the iPod did for music. It’s as easy as clicking a title on line and picking up your book. FPP: How do you see this technology evolving over the next few years? Dane: The EBM will get much smaller and quicker. The printers will double in speed from 40 pages per minute (20 sheets) to 80 pages per minute (40 sheets), and the core machine will be the size of a small copier. You can download the company’s Espresso Book Machine v1.5 overview, as well as recent articles in the New_York_Times, Newsweek and Fortune Small Business to learn more. This entry was posted in Interviews, open publishing, publishing strategy, publishing technology and tagged Dane Neller, espresso book machine, print at the point of purchase. Bookmark the permalink. If you need more information than was in the Espress Book Machine v1.5 Overview in this post, probably your best source for is to contact Dane Neller directly at dane@OnDemandBooks.com or call their offices at 212-966-2222. I will forward your requests to Dane Neller at On Demand Books. They can provide technical specifications and also let you know about distribution in Portugal. We would like to receive more info regarding this print on demand printer. This could be a boon for many outlets as well as authors/publishers who constitute what is known as “the long tail”. so is this a solution which can be set to work with majority of point of sale devices? If it is, i would like its technical specs for review and possible presentation to my supervisors, thanks! There is now an Espresso Book Machine at the Darien Library in Darien, CT – come on down and check it out! !